As he launches a charity intended to help the homeless in his native country, Chelsea's John Mikel Obi is set to join other Nigerian footballers in setting up his own foundation. The 25-year-old midfielder, who grew up in the restive central Nigerian city of Jos, says he wants to provide assistance to homeless and displaced people in the West African country. Over the past two years more than 1,200 Muslims and Christians from rival ethnic groups have been killed in violence in and around Jos - a situation that has shattered lives and left many people homeless or displaced. 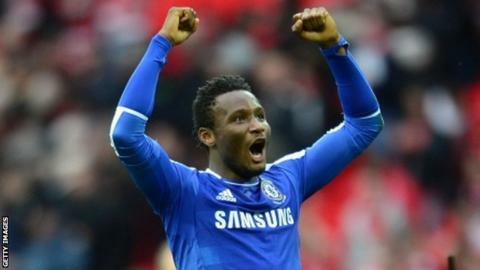 "The foundation's aim is to get people back on their feet, and hopefully raise the aspirations of the affected people," Mikel told BBC Sport. "I grew up in Jos. It wasn't easy for me as a kid, and to watch people going through a tougher situation now is just unbearable. "Some people have been very lucky but some are not, so it will be to get them to do something positive after these setbacks." Mikel, who started out at local side Plateau United, knows just how hard it is to make it in the game after a chaotic football journey from Nigeria to Norway, through South Africa before landing in London. But the Nigerian international says that, even though he is not the highest earning footballer in the world, his aim is to help others get involved in this foundation. "I intend to make this a lifetime thing if it achieves its purpose. I have been in talks with other NGOs and have approached a number of corporate organisations. "Hopefully, they'll see that they can get involved with The Mikel Obi Foundation," he said. Mikel wants to expand the activities of his charity for the needy across the country, but said that the foundation will start its work in Jos. "Nigeria is a huge country; it's one step at a time. It will start in Jos and, gradually, we'll take it everywhere with time. "There are plans to support former footballers who fell on hard times, but that is only being discussed for now. "I've been getting positive feedback from those we've approached. I'm confident there are lots of opportunities available for them to join in." Former Nigeria captain Nwankwo Kanu, a Unicef Nigeria Goodwill Ambassador, set up the Kanu Heart Foundation in July 2000 to address the problem of heart-related diseases in Africa. Other Nigerian players who recently set up foundations in their country include Joseph Yobo and John Utaka. Others, such as Ikechukwu Uche, Taye Taiwo and Emmanuel Emenike, often visit charity homes during their break from European football to make donations.